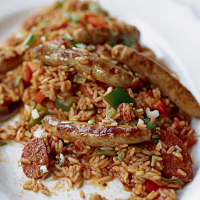 This lightly spiced Creole-style rice dish is cooked in one pan and is ready in just 30 minutes, making it a perfect midweek meal for the whole family. Heat the oil in a large pan and cook the chorizo for 2-3 minutes, until the paprika oil is released. Add the chipolatas and cook for 3-4 minutes until lightly browned on all sides. Tip in the rice and stir until coated in the oil. Add the tomatoes and stock then cover and simmer for 15 minutes, stirring occasionally. Add the peppers and salad onions, reserving some chopped onion. Cover and cook for a further 10 minutes until the rice is tender and most of the liquid has been absorbed. Serve garnished with the reserved onion. For a spicier, more adult, taste add 1 teaspoon of hot chilli powder or a dash of Tabasco. Substitute cubed skinless chicken breast for the sausages, if you prefer. Recipe will serve four adults, adjusting nutrition accordingly.